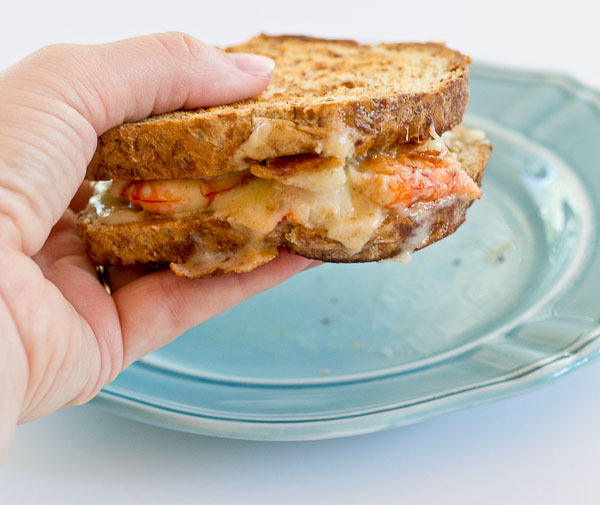 This Shrimp Grilled Cheese doesn’t hold anything back– melted cheddar cheese, buttered toast, and large grilled shrimp. Let loose, unwind and savor this comfort food any night of the week. Love this recipe? 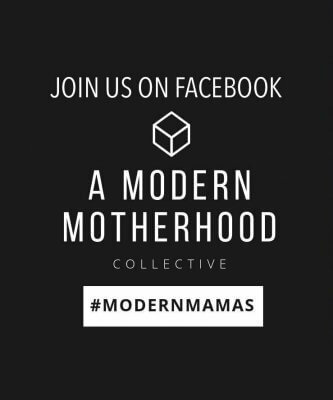 PIN IT, pretty please?! Because yesterday was National Grilled Cheese Day… you have an excuse to make grilled cheese sandwiches all week long on crispy buttery toast oozing with sharp cheddar. Grilled cheese is a lazy gal’s (or guy’s) meal or a “there’s nothing else in the fridge and I don’t want to eat out’ type of meal. 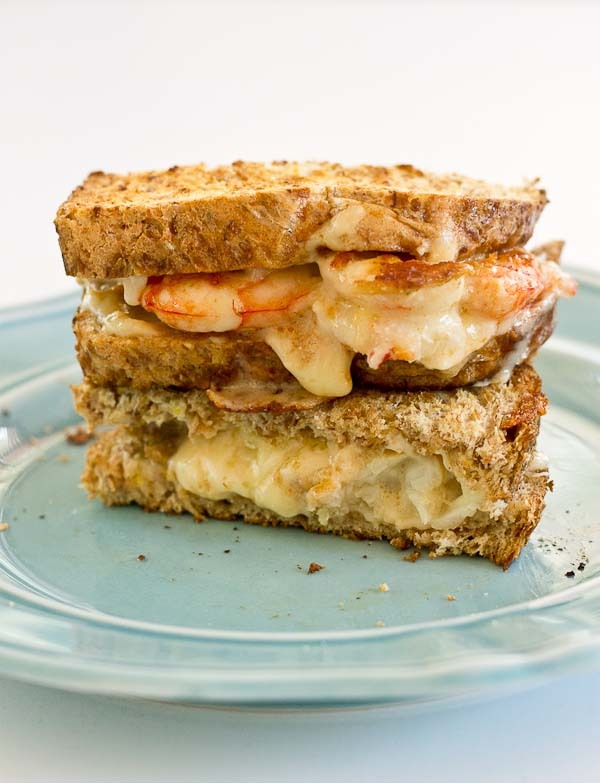 Here’s a step by step on how to make the best grilled cheese sandwich with shrimp. Step 1: Choose a high quality bread. I love using Trader Joe’s 7 Grain Bread for my grilled cheese sandwiches, or any seedy whole grain bread. I love how toasty and crispy it gets with the butter slathered all over – drool worthy! Opt for thin or thick slices. Now I don’t know about you but I’m totally craving grilled cheese for dinner. 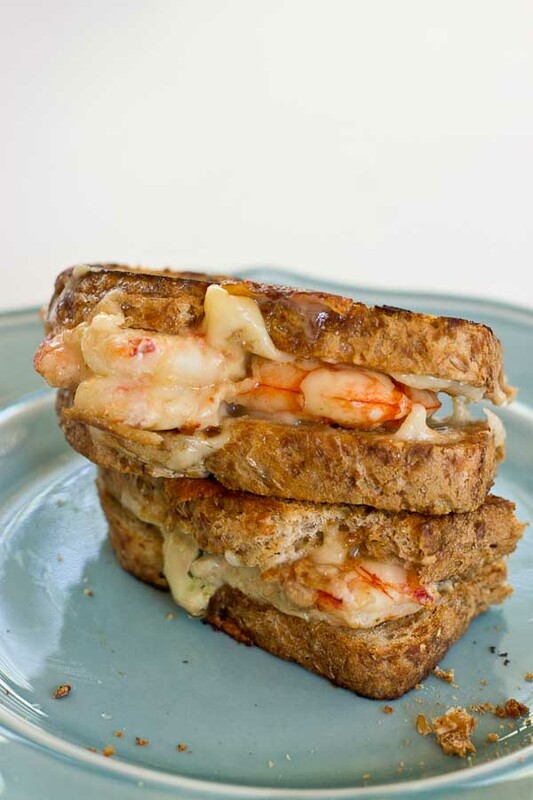 Dive into this shrimp grilled cheese ASAP! Step 2: Cast iron skillet. You can really use any skillet or even the oven to make a grilled cheese sandwich but if you want to know my kitchen tool of choice, it’s my lodge cast iron skillet. I think using the cast iron gives that restaurant quality grilled cheese experience. Step 3: Butter makes it better. And no you can’t leave out the butter when making grilled cheese… it’s just not right. If you’re going to eat grilled cheese, eat the dang grilled cheese the right way and toast the bread with butter. My mom makes my toddler super epic grilled cheese, by using a “special butter”. Herb garlic butter. Say what?? grandma knows how to spoil him, and she knows what’s up. So if you want to really elevate a grilled cheese sandwich use an herb garlic infused butter. Butter up the skillet and heat it until the butter begins to bubble–then add your bread to the skillet, rubbing it in butter on one side. Step 4: Pick your cheese. If you ask me a high quality cheese is EVERYTHING, it is grilled CHEESE after all. So it’s all about the cheese. 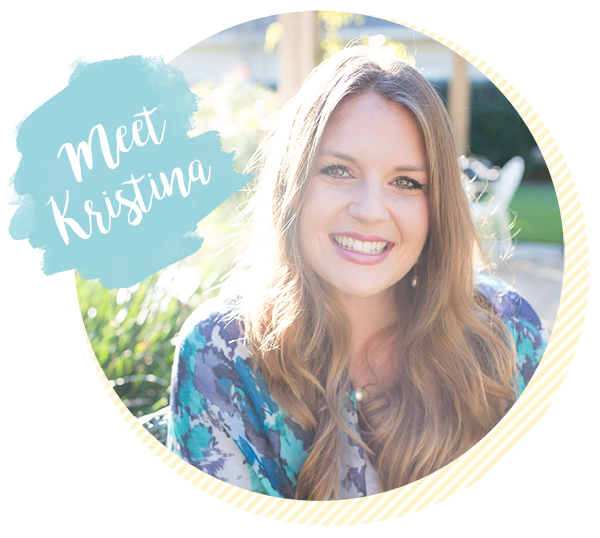 I pretty much always choose a sharp cheddar when we’re talking grilled cheese sandwiches. And sometimes I’ll get fancy and mix two or three cheeses together. What what!? You can use shredded cheese or thinly sliced cheese. It’s all good. Stack your cheese on the bread and cook over low heat until cheese melts, and toast is crispy. Step 5: Cook your shrimp. Over here we love BIG and JUICY pieces of grilled shrimp in our sandwich. Another reason why the cast iron skillet is so clutch. While the cheese and bread are cooking, defrost your shrimp and place them on the skillet for some color and grilled flavor. We use precooked shrimp, deveined shrimp because it’s easier…but you do you. Step 6: Pick your pairings. 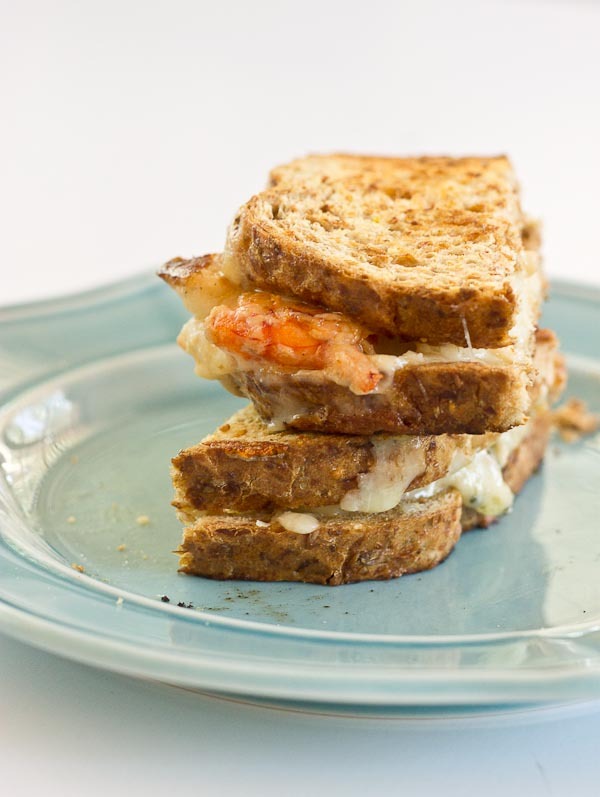 Pair this Shrimp Grilled Cheese sandwich with our instant pot tomato soup or a bowl of fresh spring mix with a little vinaigrette dressing! Dig in and savor every bite. 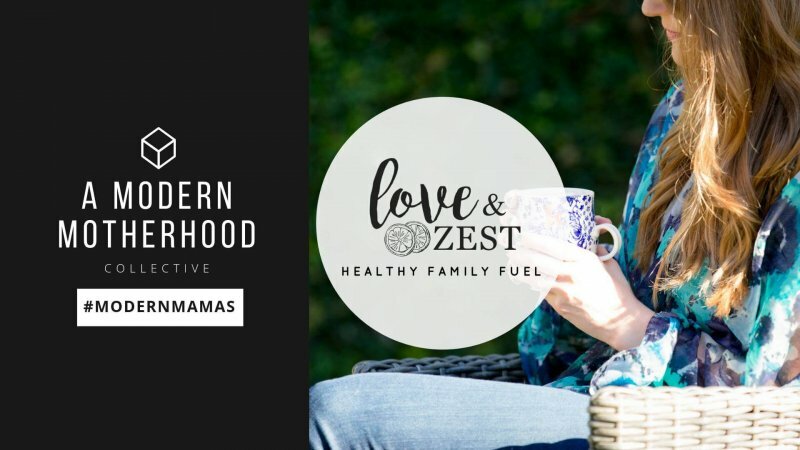 And if you want even more dinner ideas, check out these resources. Heat butter on non stick skillet over medium heat. Place two slices of toast on buttered skillet and top each slice evenly with cheddar cheese. While bread is toasting, place shrimp on skillet to heat for a minute or two. 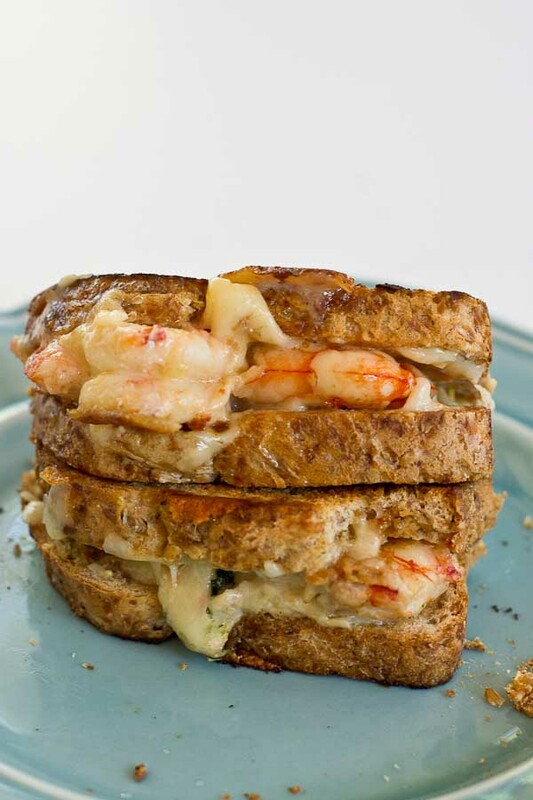 Add warm shrimp to one slice of toast and nestle it into the melted cheese. 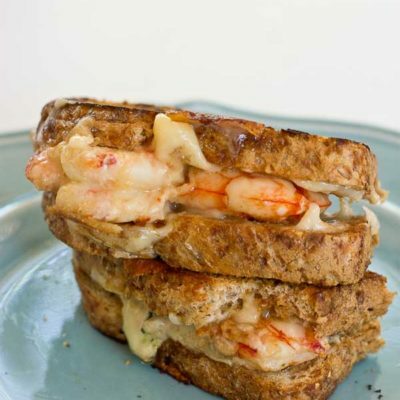 Using a spatula, pick up bread with just the cheese and press into side with the shrimp to make grilled cheese sandwich. Remove from skillet when golden brown on both sides and slice with serrated knife, if desired. Now this is an ultimate grilled cheese! Those shrimp look amazing! I’ll have to try this on gluten free bread! What an epic grilled cheese! Can’t wait to give this one a try! I can’t even think this looks so good! Trying this ASAP!!! Great idea! Oh my goodness this is a grilled cheese! We totally missed grilled cheese day because we didn’t have breads and it wouldn’t be the same with English muffins we had in the freezer. I guess I’ll have to plan a do over! Where’s a good place to buy pre-cooked shrimp like that? Trader joes? I got some raw shrimp the other day from the market. I assume you could totally cool that and it’s the same taste? YES!! I buy the Argentinian red shrimp from TJs!